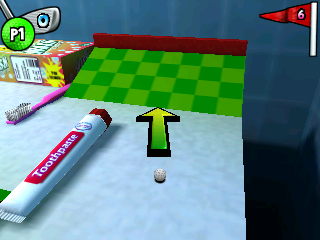 Toy Golf is a sports game that was later released on the PC in 2006. It contains nine holes spread between three different tournaments; Bronze is available immediately, but to unlock the Silver and Gold tournaments you'll need to finish with at least even-par. The gameplay is simple and the only control you have is to line-up your shot by moving a cursor and then selecting the necessary strength on the power bar. While the mechanics are intuitive and the metre moves at a playable speed, it's tricky to consistently execute shots as a very specific amount of power is required. For example, many times you'll attempt to tap the ball forward a tiny amount, only to end up hitting it too far or too little! Even the difference between two digits on the power bar is huge, and it becomes a gigantic issue when you discover that shortcuts rely on you stopping the metre at an exact number! What follows is some deeply frustrating gameplay right from the outset, starting with the punishing first hole. There's nothing that helps to ease you into the action and the only way to pass the Bronze tournament is to repeatedly play the same three holes over and over again until you develop a strategy, or (more likely) get lucky! To make the situation worse, there's no restart button if you make a mistake, which forces you to quit to the main menu every time you want to retry. Some of these frustrations could have been eased if the course design was up to scratch, but the measly nine holes are lacklustre with no interaction from the promising locations which include a Bathroom and a Kitchen. The only stage with any amount of imagination is the par 3 Toy Room hole where the ball pretty much rolls itself down a lengthy obstacle course. If you enjoy banging your head against a brick wall, Toy Golf will be right up your alley with its extreme trial-and-error gameplay and inaccurate control mechanics. It resembles a badly made shareware demo, and its low margin for error is really just a way to disguise how barebones the entire package is. Random trivia: A sequel called Toy Golf Extreme was released on the PlayStation 2 in 2008.